Bed and breakfast in Ulverston. Ulverston is a friendly market town situated between the mountains of the Lake District and shores of Windermere and Morecambe Bay. One of the most prominent landmarks on the Furness Peninsula is the Hoad Monument above Ulverston, which was erected as a memorial to the explorer Sir John Barrow. Ulverston has many specialist shops, cobbled streets and a bustling market on Thursdays and Saturdays. Ulverston was granted its market character in 1280, and operates as the cattle market for the area. Ulverston is the birthplace of Stan Laurel who was born in Argyle Street on June 16th 1890. The town has a unique Laurel and Hardy Museum filled with the artefacts of the comedy duo, together with a small cinema showing their films. Also see Ulverston & Ulverston attractions. If you are in the right town but cannot find the accommodation you want on this page, you might consider or Ulverston hotels. 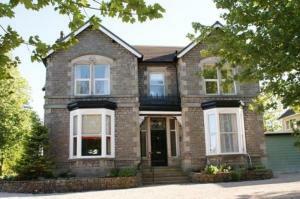 Lonsdale House is a quality town centre hotel located in traditional lakes market town. A 10-minute drive from Lake Windermere, Lonsdale House Hotel offers free Wi-Fi and good breakfasts. Ulverston's market square is a 2-minute walk away. Each en suite room at the friendly Lonsdale House Hotel has tea/coffee and a flat-screen TV. Eleven Restaurant serves a modern British menu of local produce. Lonsdale House has large private gardens, along with 2 lounges and large-screen TVs. About 2 miles from the town. Eden Lodge is a new country-house hotel with a modern style. It is located at the southern end of the beautiful English Lake District and serves fine cuisine in its restaurant. The beautiful Edwardian building is located in its own mature parkland and overlooks the magnificent Morecambe Bay to the east. The beach is a 10-minute walk away, and the Manjushri Buddhist Temple and its wooded grounds are close by. The hotel aims to create a relaxing stay in beautiful surroundings and provide a enjoyable eating experience. On the shores of Levens Estuary, The Bay Horse Hotel is just 2 miles from Ulverston centre. With cosy log fires and a traditional restaurant, there is also free parking and free Wi-Fi. The rooms at The Bay Horse feature large windows and en suite bathrooms. Rooms also have tea and coffee facilities, a hairdryer and ironing facilities. Some rooms have impressive sea views and private balconies. The Bay Horse Conservatory Restaurant serves a creative British menu using local produce. The well-stocked bar offers a range of beverages and real ales, and features a spacious terrace. Traditional Cumbrian breakfasts are also available daily. Surrounded by beautiful countryside, The Bay Horse Hotel offers easy access to nearby walking routes and fishing lakes. Lake Windermere and Coniston Water are a 20-minute drive away, and Barrow-in-Furness is 25 minutes' drive. For bed and breakfast in other areas nearby see bed and breakfast in Grange over Sands & bed and breakfast in Barrow in Furness.